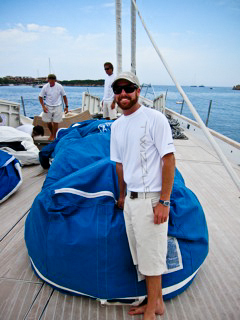 After attending the California Maritime Academy I went to work running several yachts on the west coast of the USA. In order to gain unlimited tonnage sea time I took the 2nd officer position onboard a 380ft Offshore DP vessel working internationally. During my time as a 2nd officer on DSV’s engaged in the oil industry, I gained valuable skills as a DPO and as an officer onboard commercial vessels. My shipboard experience enables me a better understanding of the operational needs and limitations of the vessel and crew making me an excellent shoreside manager. Using my Dynamic Positioning knowledge I gained offshore, I moved onshore to manage the Dynamic Positioning Operations for the America’s Cup Race Management team. I was soon promoted within the America’s Cup to Guest Logistics Manager and VIP Vessel Fleet Manager where I successfully managed the wellbeing and safety of over 200 VIP guests on the water daily and acquired and maintained the large fleet of spectator boats used for the 2013 America’s Cup in San Francisco. Working for the America’s Cup not only challenged me to manage a large and diverse staff of employees and fleet of vessels while under stringent political, environmental and budget restrictions, but also successfully refined my abilities to work well under pressure with strict deadlines. Applying the fleet management skills I gained through the America’s Cup I moved on to manage a fleet of 4 privately owned vessels. Presently I combine my acute attention to detail, unfaltering work ethic, and management skills to ensure the safe and efficient operation of all vessels. During time off from work I am the racing navigator for several inshore and offshore racing yachts as well as actively engaged in maritime consulting.